You awaken to a world engulfed by death and disease, with very few signs of life. You look around to see the damage that has been done. The Elven Sages had foreseen that you would awaken to stop the blight - but you were too late. The forests have become filled with diseased creatures and infested artifacts of a ruined civilization, a civilization you used to be a part of... You quickly come to your senses and ready your weapon, remembering your vow to protect and restore the sacred Elven Forests for all of eternity. Customize your loadout prior to each match by choosing a class, a weapon, and a set of 10 abilities. There are two caster classes: Wizards and Druids; and two melee classes: Rogues and Clerics. Level up your character to unlock new survival campaigns and to equip higher level spells and weapons. Level up each weapon to unlock weapon talents and enchantment slots. Weapons gain experience 4 times as fast as your character. If you have a Wizard weapon equipped, you can only equip abilities for Wizards and Casters. If you equip a Rogue weapon, you can only use Rogue or Melee abilities. Once a match is over, you can re-select your class, weapon, and spells before playing another match. Players are never expected to lock their character into choosing one single class. As the head developer, I have always been a fan of games that offer the player many ways to progress and customize their character, and even more importantly: games that offer a lot to do after you've progressed your character. As with any game that has a level-up system, there will always be a point where players hit the maximum level. After hitting the level cap, players will gain access to hidden areas of each survival campaign, offering new objectives and bosses that are not available to players who are still leveling up. Additionally, players can compete in casual or ranked PvP scenarios. Choose a class and create a customized load-out and see how long you can survive while exploring the Afflicted Elven forests! Enemies will continue to spawn in waves, getting stronger every round. However the waves of enemies are not the primary focus - while surviving is important, players will also be left to explore and discover many new weapons, spells, and items by completing formal quests as well as hidden objectives exclusive to each survival map. At the end of each match, players will be rewarded gold and extra experience based on how many waves they survived. Enter into a battle to the death alone or with a team, and fight to be the last team standing! Arena maps are much smaller than other maps. Survival war is almost identical to the normal Survival Campaign, except there's another team of players on the other side of the map to compete with. Work to find and eliminate the other team's base camp to prevent them from re-spawning in order to win the match! After your team has won, you may choose to carry on with the game as a normal survival campaign, or exit the match to claim your winnings immediately. Join a large team and battle the enemy team for control of the objective! Battleground scenarios include objectives such as capture the flag, king of the hill, and last man standing. A Plagued Zone refers to any areas of the map where the foilage is dead and everything is covered in plague goo! Enemies that have been afflicted by the plague are stronger and faster in areas that are dead and afflicted, while Elven players regenerate faster in cleansed areas of the map where the forest is alive and well. Players can restore dead & afflicted areas by completing key objectives, restoring sacred structures, and even by casting certain spells that cleanse the nearby area. We're also working on continuous graphical improvements to make the plague areas appear more immersive - our next graphical improvement in the works is to add a plagued mist that resides over top of the afflicted areas in order to make them stand out more. Continuing on the concept of "Plagued Structures", we are also working on a new structure called the Plagued Nest. A Plagued Nest has a small chance of spawning in an area that has been afflicted by the plague. The nest will slowly grow over time as it continues to spread the plague and spawn additional plagued enemies. If left unattended to, a plagued nest can grow to make an entire area of the map impassible and quite dangerous until its core is destroyed. We've added a few new enemies, and are focusing on making the AI more reactive and challenging. The Plagued Spirit, for example, can evade projectiles and "Phase Shift" to appear behind unsuspecting players. 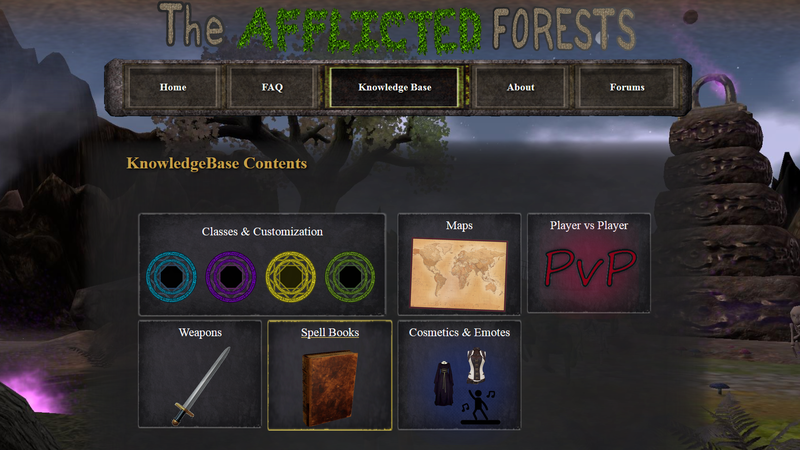 Our website for "The Afflicted Forests" is nearly complete. We are just waitiing on some final touches to the knowledge base before we announce the official launch of our site. 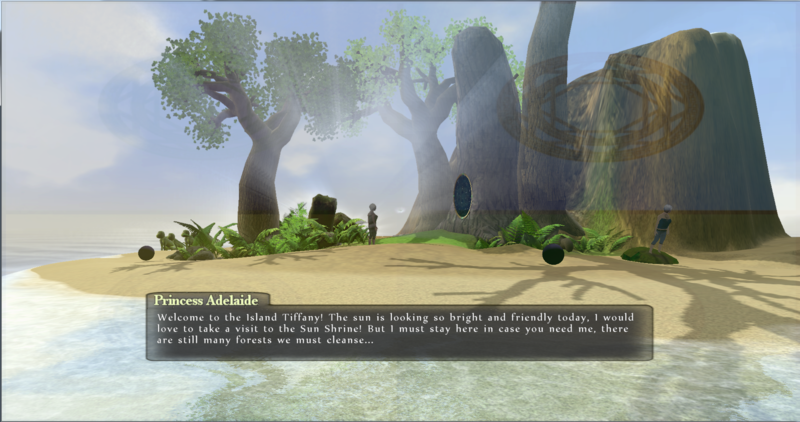 We've also finished up a Dialogue System that displays text and also plays voice audio for certain NPCs. We're currently working on finding voice actors so that all of our dialogues can be voiced by the time The Afflicted Forests is released on Steam. We're also working on many more quests that will not be displayed until release, and we are constantly working to add new weapons and spells so that the combat system (and especially character progression) can be as exciting and rewarding as possible. Information about the combat and customization mechanics, as well as the main game mode: Survival Campaigns (co-op and solo).